The winter months bring an increase in home fires with more indoor activity and an increase in lighting, heating and appliance use. Your best defense against these tragedies is a working smoke alarm. Smoke alarms should be connected to your home’s wiring system, so you can be sure they are always working. In the event of a power outage they are equipped with a battery for back-up. It is also a good idea for smoke alarms to be inter-connected so when one goes off, they all go off. RF (Radio Frequency), wireless, units are capable of this and are now available and do not require interconnecting wiring. They require one detector to be hardwired and the rest work off of radio frequency and will all sound together no matter which ones senses smoke. Interconnected smoke alarms increase your chances of escaping a house fire before it spreads out of control. If you are unable to install smoke alarms using your house wiring, you should at the least install the battery operated type and install more than one. No matter what type of smoke detector you choose, be sure to test it monthly and replace the battery at least yearly. The smoke detectors themselves should be replaced every 8-10 years. For more information contact us at 503-657-4958 or by email at info@parkinelectric.com. Parkin Electric provides free estimates and free home safety inspections. Has there been any recall notices on FPE Stab-Lok circuit breakers or panels. 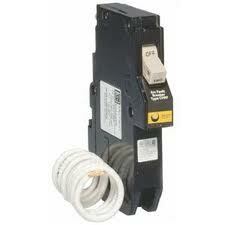 What is our opinion as to the safety of FPE Stab-Lok circuit breakers and panels. In answer to the first question, in our research, we have not been able to verify any official product recall on the Federal Pacific Stab-Lok circuit breakers or panels. However, on March 3rd 1983 the U.S. Consumer Product Safety Commission (CPSC) released a report basically stating that commission testing confirmed that certain FPE Stab-Lok circuit breakers failed UL calibration test requirements. However their limited testing was insufficient for the commission to accept or refute whether the breaker failures lead to a hazardous situation. We have attached the complete CPSC report for your review. To the second point regarding our opinion of the breakers in question, we believe that based on our personal experience, and the vast amount of second hand anecdotal information, these circuit breakers are less reliable than other comparable products produced by other manufactures, and may pose more of a failure and safety risk over other comparable products. The primary problems associate with these breakers is that they may not trip in an overload situation, and that the breaker may not make proper contact with the panel buss. While it is not quite correct to call a non-tripping breaker a “fire hazard”, the FPE Stab-Lok breakers (as others) are primary safety devices whose function is to stop certain electrical sequences that could, if allowed to proceed, lead to fire in a building. By their own (FPE) admission, the breakers in question do not fully comply with UL requirements, and there is some evidence that FPE falsified testing procedures and results. It is important to note that UL itself did not actually perform the compliance testing on the breakers, but only monitored the production and testing done at the FPE factories. As UL standards and listings are intended to provide evidence that the product is “suitable for the purpose” under the provisions of the National Electrical Code (NEC) this is troubling to us. Please see the table on the following page which illustrates the frequency of failures of the subject breakers. Another issue to consider is the fact that many FPE Stab-Lok panels are “split bus” type panels. These are panels which do not have a main circuit breaker. 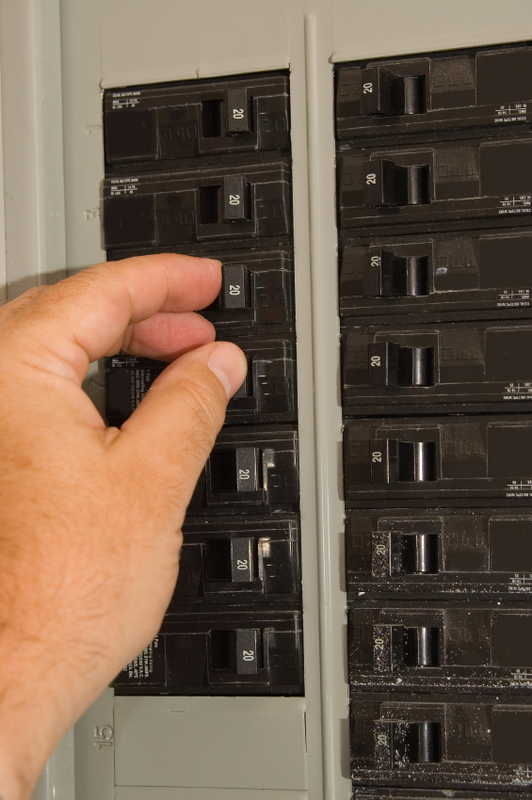 Eliminating a main circuit breaker also eliminates a safety factor in the event a branch circuit breaker jams with the contacts closed on an electrical fault. A main breaker would provide a measure of protection at a higher current trip point. A main breaker also provides a measure of protection when servicing or adding down stream branch breakers in an active (“hot”) panel. The final points we would like to make is that without extensive and costly testing (not practical for individual cases), we can not confirm with a visual (“looks alright”) and mechanical inspection (“clicks on and off okay”) whether certain breakers are, or are not, defective internally. And finally, because production of these products ceased in the mid 1980’s, the age of many of these products is now exceeding 20 years of operation (they are getting tired) and availability of replacement parts will become increasingly difficult and costly, and possess no product warranty. Based on our research, personal knowledge, and the associated failure rates found, and because there is no safe or practical way to verify correct product operation, we believe it prudent to replace all FPE Stab-Lok panels currently in use when practical. While we do not necessarily believe this an “emergency” situation, panelreplacement should be considered if any repair or modifications are made or required. In conclusion, we believe that keeping these panels in operation for the long term could constitute an increased risk over other products on the market, and it may be well worth the $1000 -$1500 * average cost for replacement. If you have any questions, or need further clarification on this issue, please feel free to contact us at any time. * Replacement cost is based on a normal panel only replacement, and is approximate. Soon you will no longer be able to purchase the traditional light bulb. In 2007 President Bush signed a law requiring lights to meet certain efficiency standards. 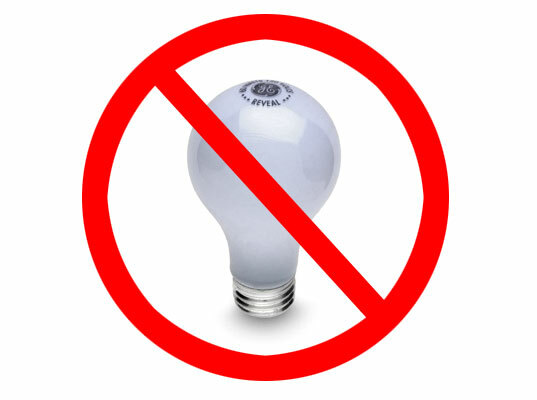 Starting in 2012 you will no longer be able to purchase 100 watt bulbs, in 2013, 75 watt bulbs and in 2014, 40 and 60 watt bulbs. There are many CFL bulb options available. Home Depot has a page on their website with good information about bulb options, applications, light output and power consumption. The Energy Trust of Oregon can help you learn more about how to choose CFL’s, shopping tips and information on where to recycle them. You can also check the U.S. Department of Energy’s Website. Don’t wait; Start Saving Energy Now! Maureen Parkin with Parkin Electric, Inc., a member of IEC (Independent Electrical Contractors) Oregon, has agreed to represent IEC and small businesses on a Small Business Regulatory Enforcement Fairness Act of 1996 (SBREFA) panel. The panel will include small business representatives from many trades organized by the Small Business Administration. The panel will provide comments to the Occupational Safety and Health Administration (OSHA) on the newly proposed OSHA regulation labeled Injury & Illness Prevention Program (I2P2). OSHA is required to have input from small businesses about the economic impact a regulation may have on small businesses. We are very excited to be a part of the team involved in the renovation of this beautiful and historic Artillery Barracks at the Fort Vancouver National Site! At the beginning of the 20th century, Vancouver was the headquarters for the Department of the Columbia, a vast administrative unit in the Northwest. The population of the post almost tripled in response to increased military activity both at home and abroad. There were not enough barracks for the soldiers stationed here, and men were sleeping in tents. An ambitious building scheme was begun that would enable the post to garrison a regiment of infantry, and two batteries of artillery. The double artillery barracks was constructed during this period, erected on this site in 1904. This Colonial Revival style building housed two separate companies, a total of 240 men. The latrines, storage rooms, and other functional spaces were housed in the basement. The kitchen, mess halls, and day rooms were on the first floor. The second floor had large dormitory style sleeping quarters for the soldiers, with smaller semi-private rooms for the officers. The 6,500 square foot of renovated space will house space for community events, and include a banquet room, a large meeting room, a smaller board room, kitchen, storage areas and rest rooms. Our part of the renovation will include modifications and relocation of the power distribution system, new lighting, fire alarm up-grades, low voltage wiring and state of the art audio visual equipment. Parkin Electric has been injury free for 3 years! Parkin Electric is proud to note that we have not had a recordable injury for three years, nor have we not had any days missed from work because of injury since 2001. This stellar safety record (our safety Mod Rate is .79) is an indicator of the effort and commitment that our electricians and management maintain to working safely. The consistent use of Personal Protective Equipment (PPE) (safety glasses, hearing protection, gloves, and hardhats) by Parkin Electric Electricians, and the practice of reviewing each job for hazards and developing a plan (written) to work safely on the each job, contributes to Parkin Electric’s injury free workplace. Our view is that safety is not a sometimes thing…. a good solid safety culture means working on improvement, everyday, all day, automatically! 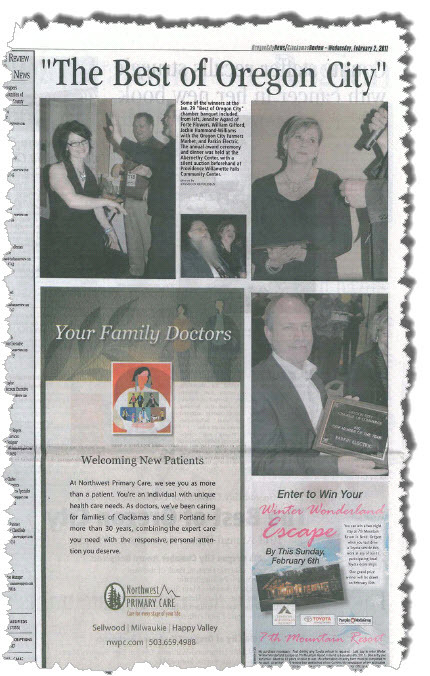 Parkin Electric was honored at the 2010 “Best of Oregon City” Chamber of Commerce Event! 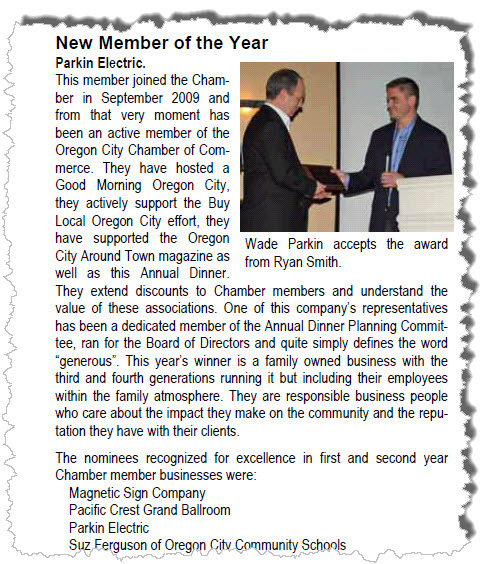 On January 29th, Parkin Electric was very honored to receive the 2010 “New Member of the Year” award at the annual Oregon City Chamber of Commerce awards ceremony and dinner at the Abernethy Center. Maureen Parkin has largely been the face of Parkin Electric at numerous chamber functions all year long, and deserves most of the credit for this award. Unfortunately Maureen had a schedule conflict and was out of town during the awards ceremony, but was dutifully informed and congratulated by her stand-in, via photo texting shortly after the presentation! Nice job Maureen! Joining the Chamber has been a great experience for us. It has provided us the opportunity to network with other businesses, and to become more involved in our community. The Oregon City Chamber and its members are very active in local government affairs, and supporting the community through volunteering their efforts. We feel very fortunate to be a part of this dynamic group, thank you for your support!